I'll update this thread with what I'm up to with the car. It arrived on Saturday and did spend a good part of the weekend crawling over it. I'm going to put a plan together with the specific issues that I would l like to address. With 3 kids starting college shortly I can't go crazy but I would like to get it sorted for driving and clean up some of the cosmetic issues. I have already removed the trunk and pilot rays. The sidemount covers will be a topic for a different thread. Also the tires. Since this is a free forum, it looks like they won't give us the space for hosting images so they will need to be hosted elsewhere and linked. I've got a photoshopped version of where I'm going and I'll link it when I find a place to post it. Picture right off the trailer. Here is a photoshopped depiction of the direction I'm going in. I'm not thrilled with the fender color but it is close to original so I'm going to leave it alone. Painted side mount covers, removal of accessory trunk, black wall tires. I remember John Barker taking delivery of this car in Lansing in 2004. My dad has a picture of he and Barker drinking a beer on the running board. A. J., I think your photoshop of what it will look like is stunning! Are you planning on removing the luggage rack and the trunk? Are these for sale? I agree that the trunk detracts from the 'look'. I think I like the black walls and I now see what you were saying about 'painting the side mount covers. I kept thinking your were planning on painting ALL of the side mount, including the chrome part around the tread. John, I gave the trunk and rack to a friend who has a T speedster. You gave away the REO trunk and REO rack to go on a FORD Model T? ? What a waste! Though I said it before, I will never get tired of saying it. Your Reo has to be the nicest club sedan ever. Gorgeous lines! Congratulations! The blackwalls and sidemount with chrome and paint, as were most of them, looks great! I will take some pictures and post them. If the trunk and rack are REO specific then somebody with a REO can have them. I'll have to let my friend know. Victor, I think I mentioned we have never owned a sedan before. My dad was not on board at first but has come around now that he has seen the car in person. I think the greatest club sedan would be the Duesenberg 20 Grand which has a Rollston body, followed by the later Dietrich bodied Packards. After that I agree this is the next one in the list! A. J., what you do with those parts is your business. I was just giving you a hard time. I do think the trunk and rack are REO items, but if you promised them I would let it stand. I think both are beautiful cars. It is like saying you love one of your kids more than another. Here is the car without the trunk rack or trunk. I also took of the CCCA badge (I'm a big fan of the CCCA too!) and the trippe lights. I'm really like the lines of the nose and the extra lights were confusing things. A J, I would be interested in the trippe lights if they come up for sale. Here is a picture of the 845 Packard with the duplicate body. The wheelbase is 3 inches shorter and I think the difference is in the cowl. 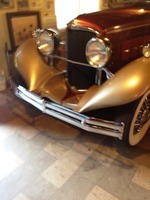 There were three on the Packard chassis and one was famously in the Harrah collection for years. One was just at Pebble Beach recently where it was a class winner.